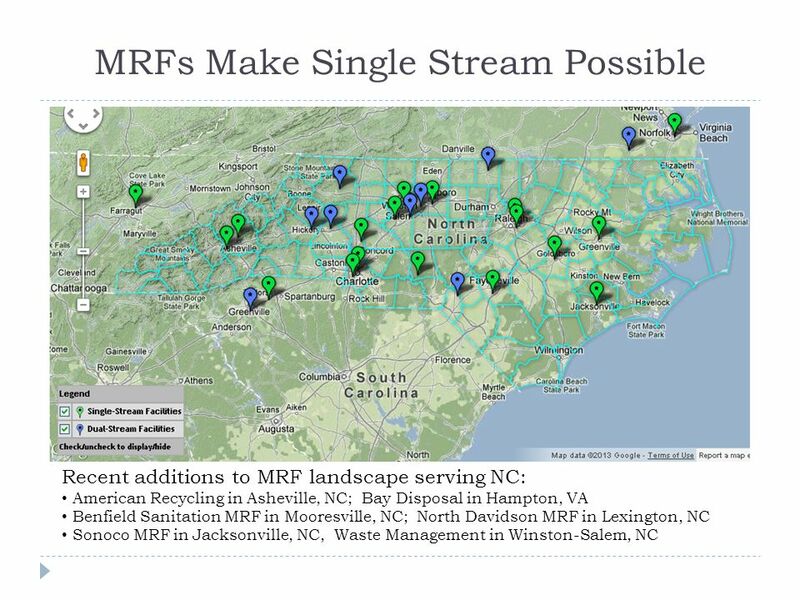 Single Stream Recycling ~exploring the impact~ Rob Taylor NC Division of Environmental Assistance and Outreach. 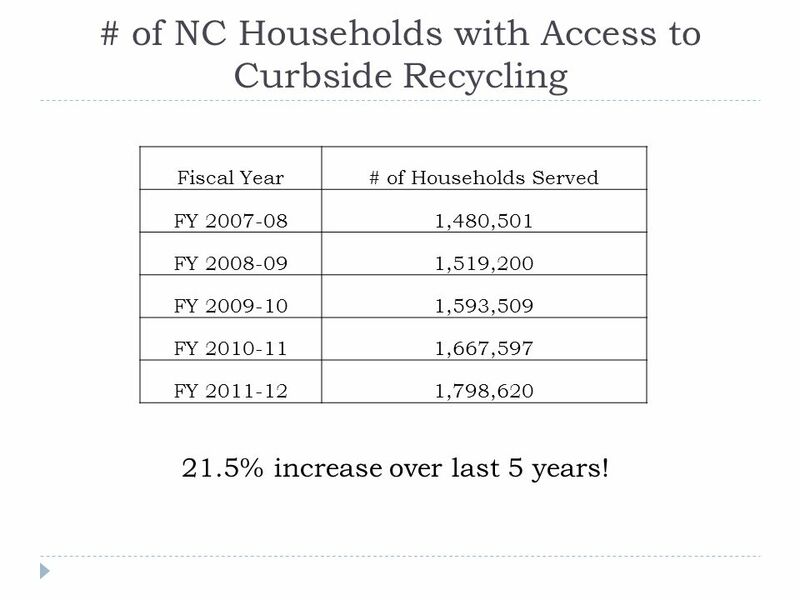 6 # of NC Households with Access to Curbside Recycling Fiscal Year# of Households Served FY 2007-081,480,501 FY 2008-091,519,200 FY 2009-101,593,509 FY 2010-111,667,597 FY 2011-121,798,620 21.5% increase over last 5 years! 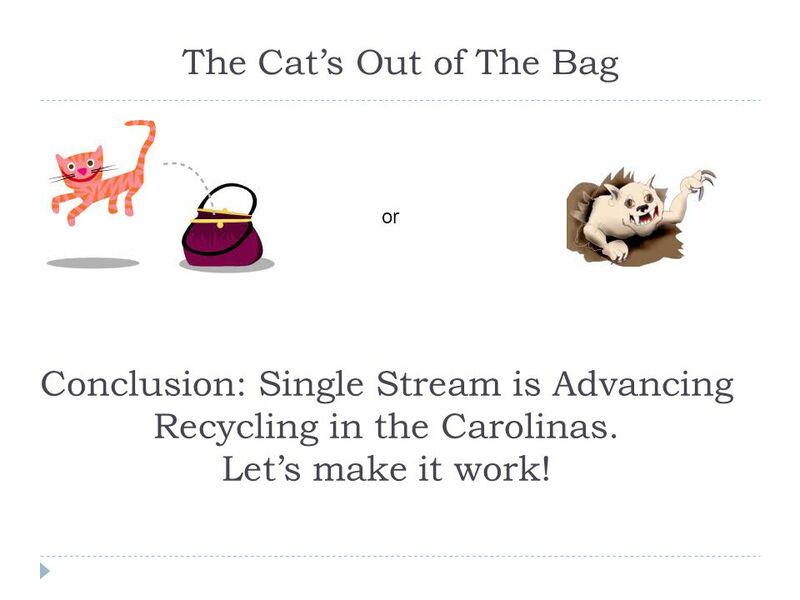 21 The Cats Out of The Bag or Conclusion: Single Stream is Advancing Recycling in the Carolinas. Lets make it work! 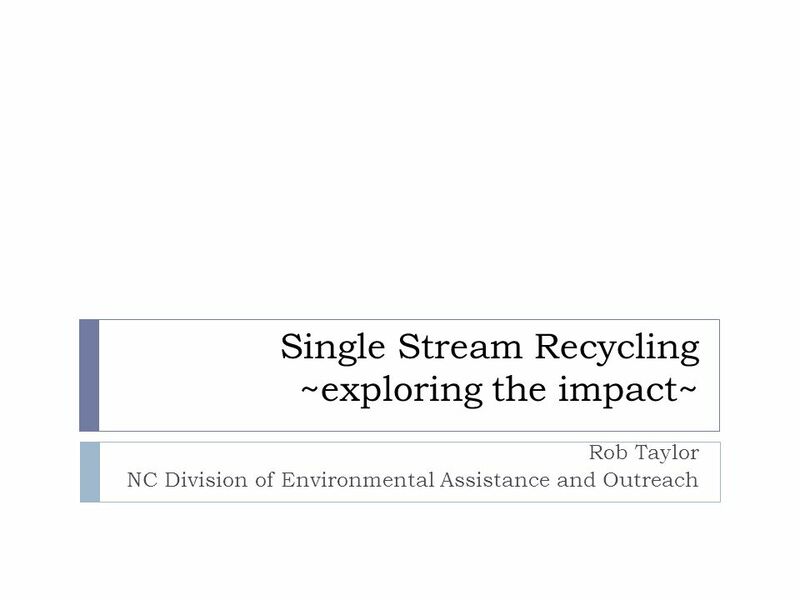 Download ppt "Single Stream Recycling ~exploring the impact~ Rob Taylor NC Division of Environmental Assistance and Outreach." 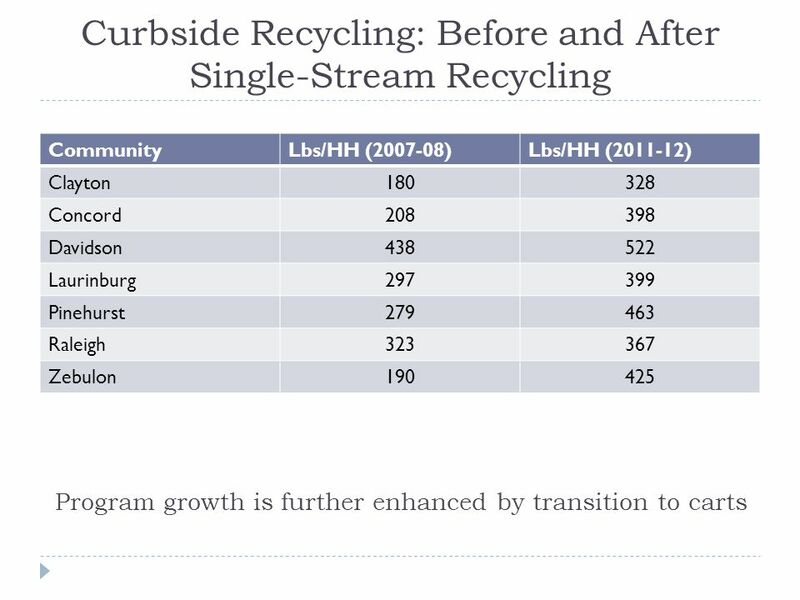 Recycling: Do Your Part! 1 Together With. 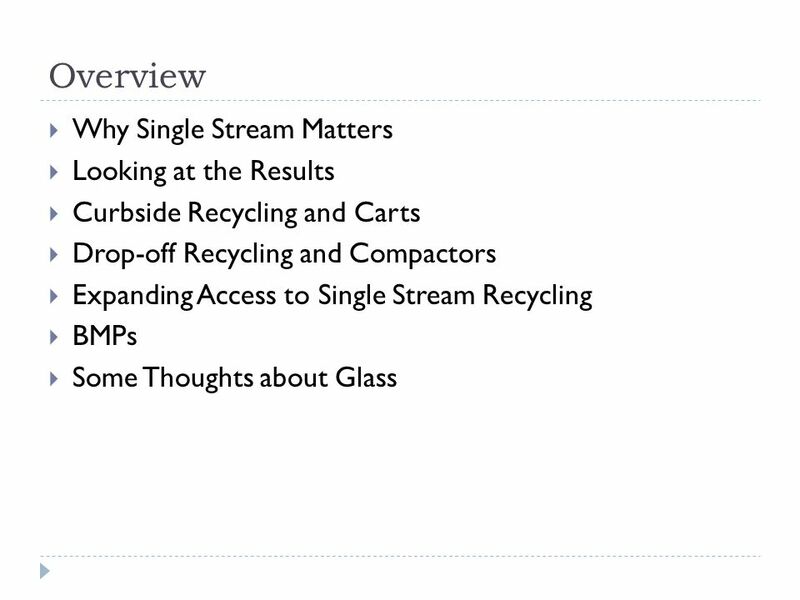 What kinds of things do you recycle? 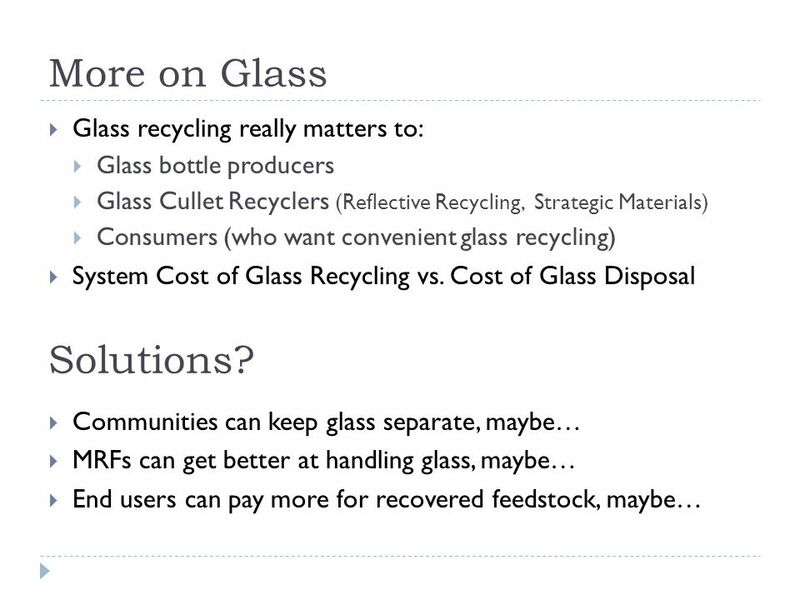 What kinds of things dont you recycle? 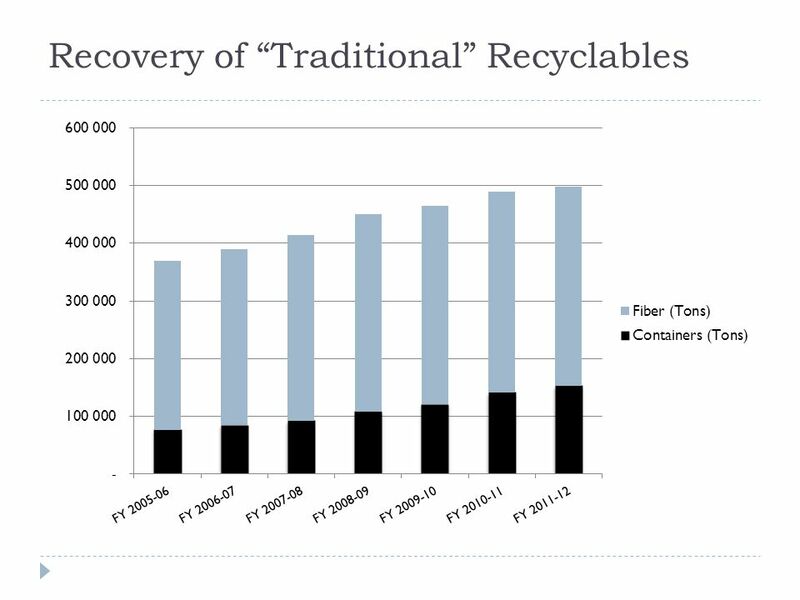 How often do you throw away recyclable. 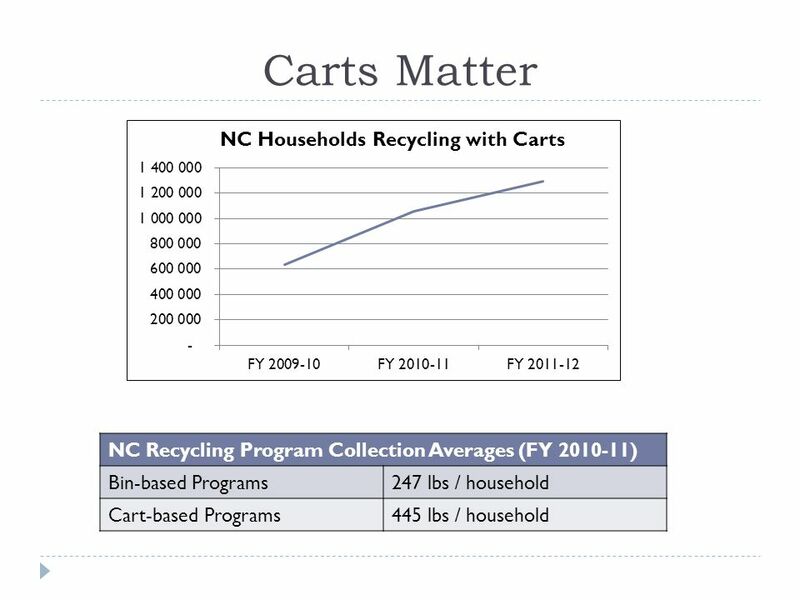 General Observations on Recycling Policy in North Carolina Laws and regulations have been key to almost every aspect of recycling progress in NC Early. Carolina Recycling Conference Myrtle Beach S. C. Keep America Beautiful North Carolina Solid Waste Enforcement Officers Association. 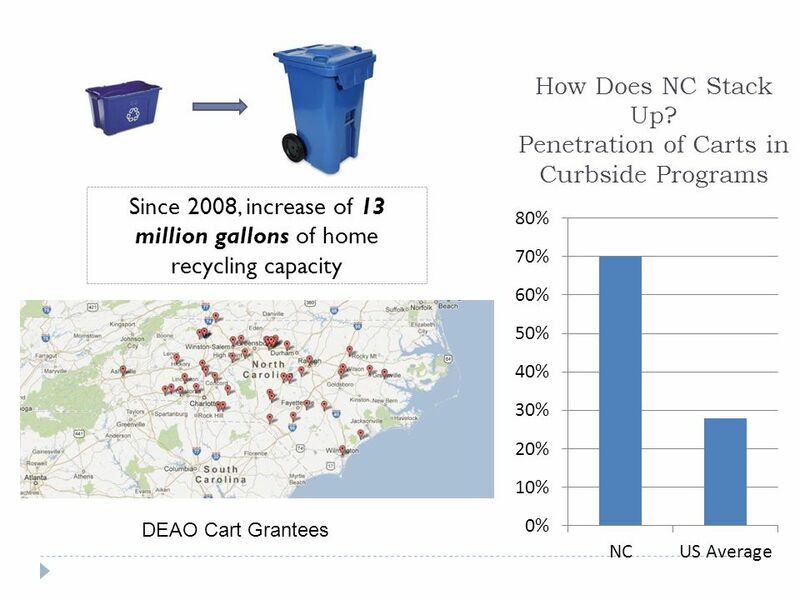 Resources For Recycling Professionals A tutorial on locating and using NC DEAO products. Scott Mouw NC DEAO. 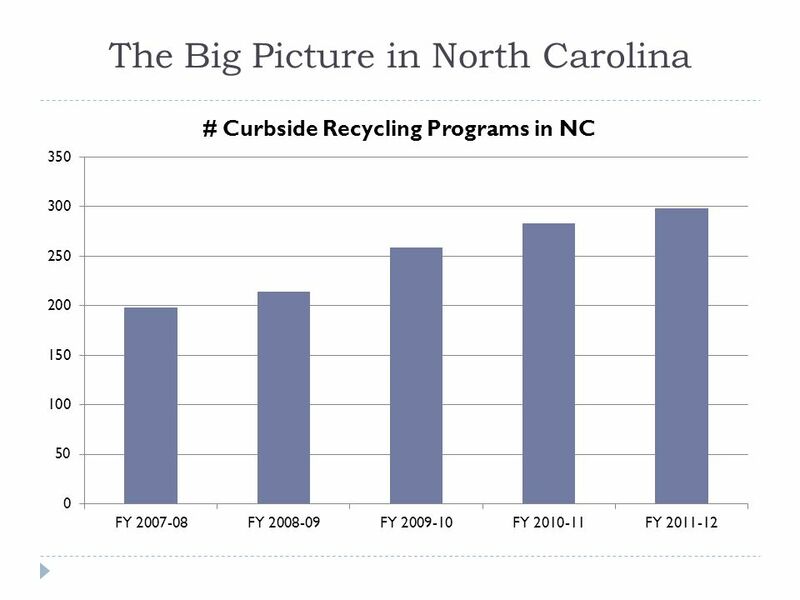 Signs of Progress Recycling has helped reduce disposed tonnage in North Carolina by 2.4 million tons since 2007, a decline of 20 percent. 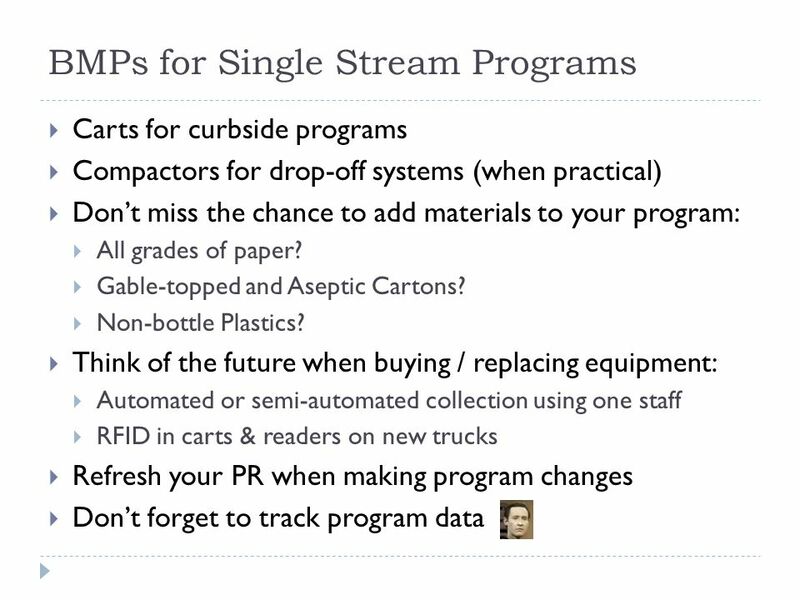 Why Product Stewardship? THE LOCAL GOVERNMENT PERSPECTIVE Zack Hansen, Ramsey County Leslie Wilson, Carver County December 15, 2010. SERDC 120: A New Effort January 23, SERDC SPONSOR LEVEL MEMBERS 2. 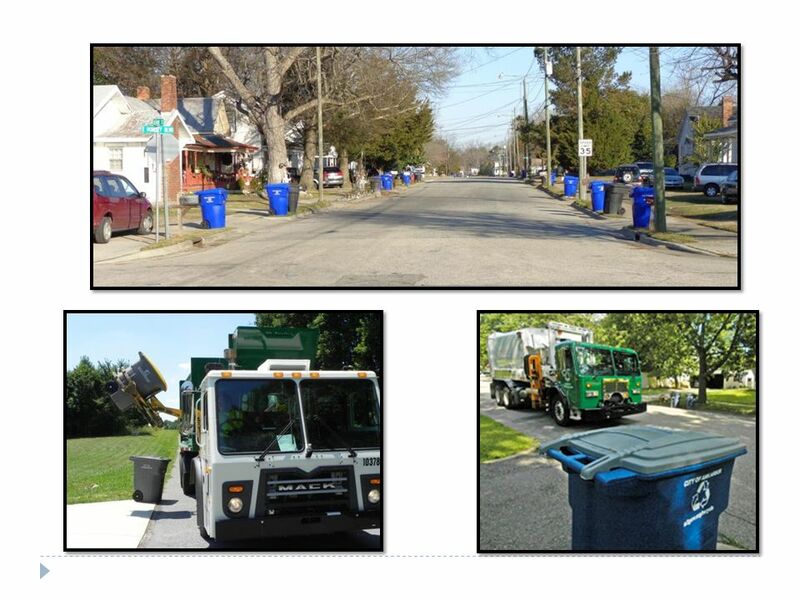 CITY OF FORT LAUDERDALE Multi-Family Recycling Guide. Archetype Blitz Bild Sustainable Home Waste Management & Diversion VOLUNTEER - TARGET ZERO WASTE TEAM PERSONALIZED MUGS FOR VOLUNTEERS = LESS WASTE CONTRIBUTING. 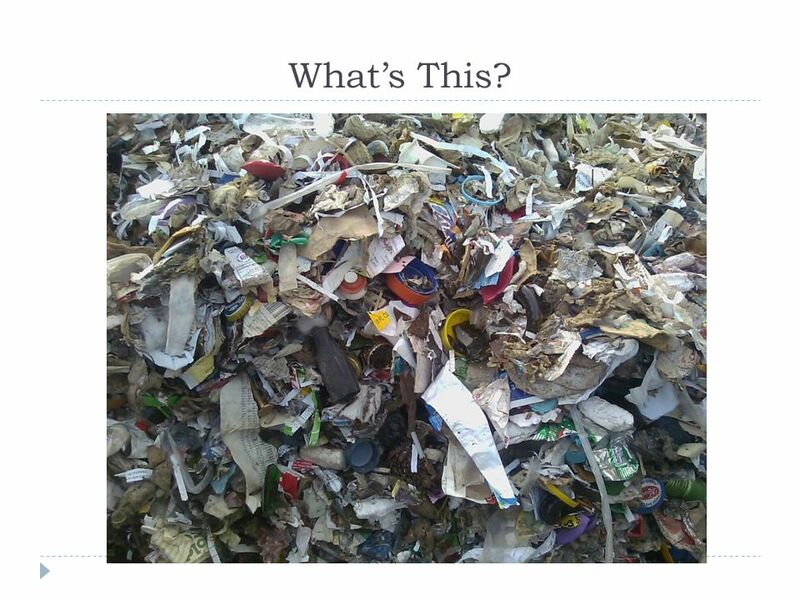 Waste Aware North East County Durham Waste Awareness – Working in Partnership Vicki Burrell Durham County Council. 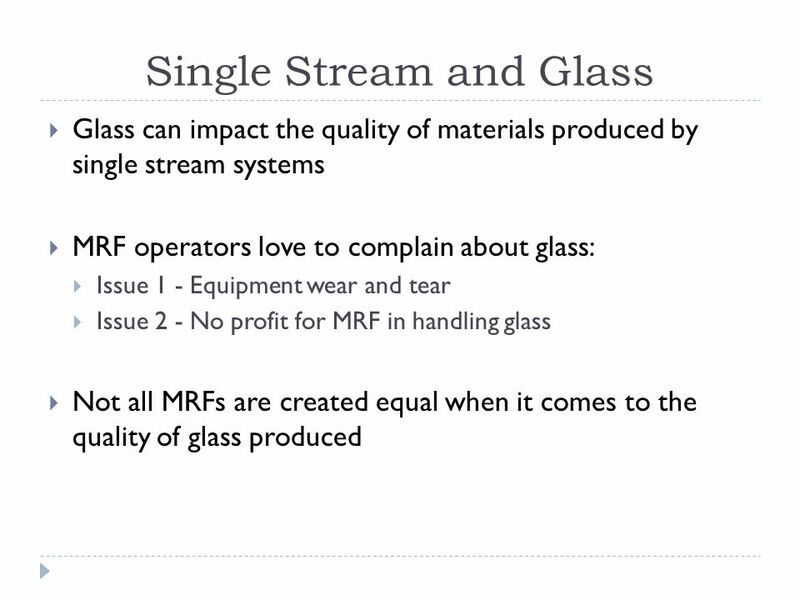 Adapted from the original presentation for the AOR Fall Forum, 2013. 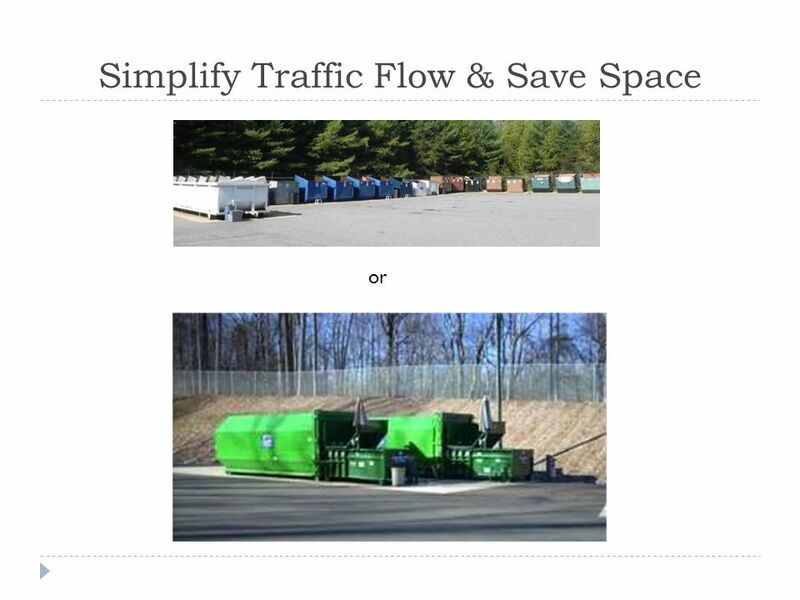 Division of Pollution Prevention &Environmental Assistance The ABC’s of a School Recycling Program. 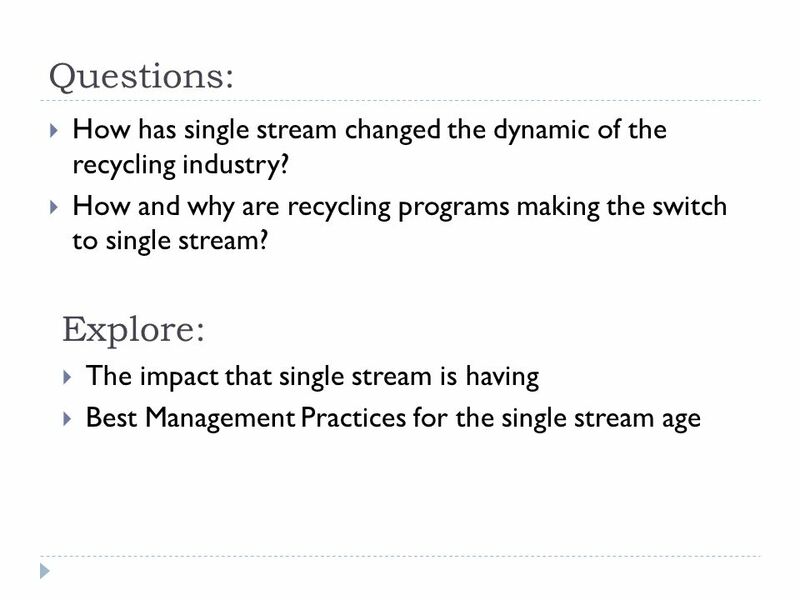 Advancing Recovery: Collaborating for New Recycling Streams Sustainable Packaging Coalition Advance September 10, 2014 Minneapolis, Minnesota 1. 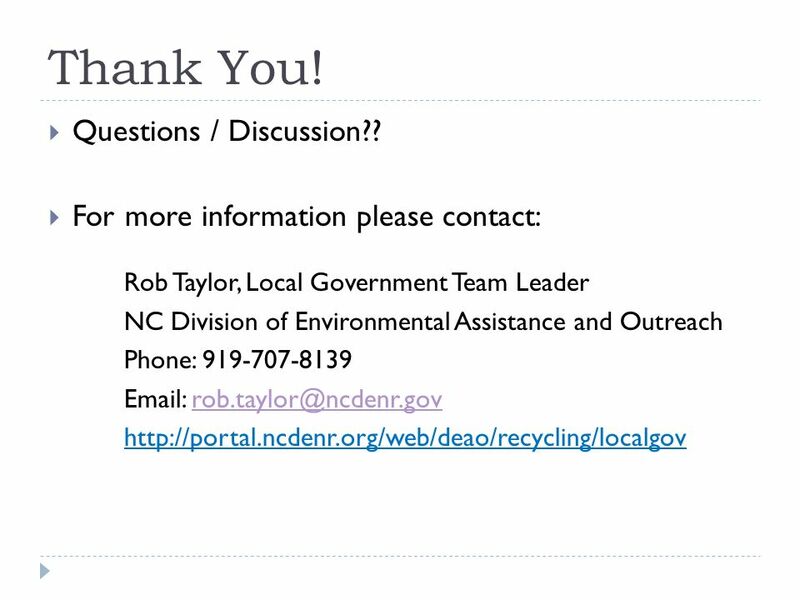 NC Recycling Issues NC Division of Pollution Prevention and Environmental Assistance. 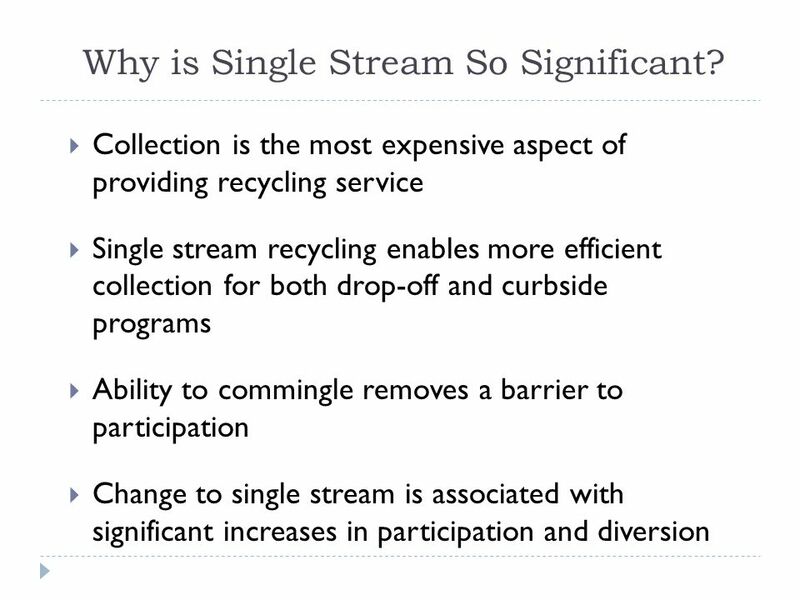 Single Stream Recycling Brown-Outagamie-Winnebago Counties City of Oshkosh Common Council, June 10, 2008. 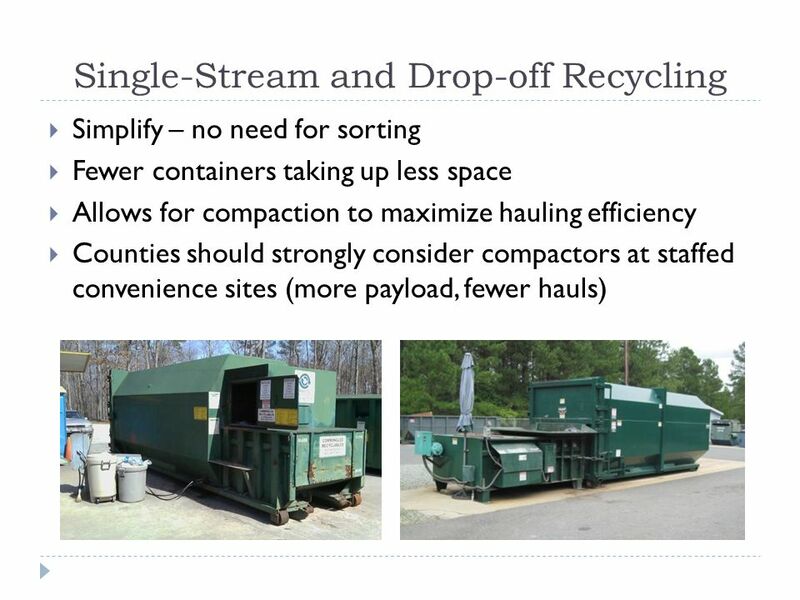 Prepared by Denese Ballew and Brian Taylor from Land-of-Sky Regional Council Solid Waste Management Study for the Town of Waynesville. 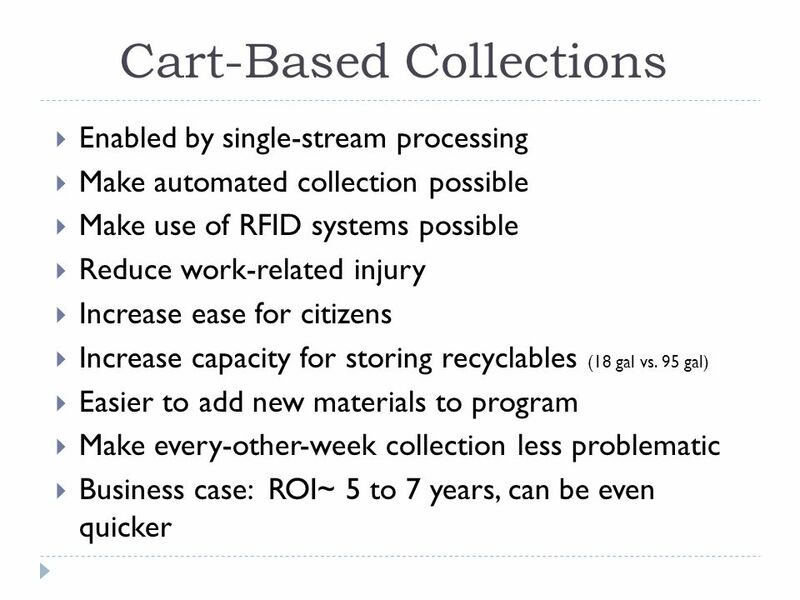 Recycling Revenue Fund Department of Solid Waste Management.